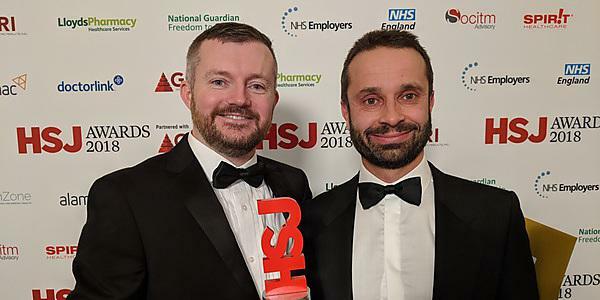 A Plymouth-designed app that helps to carry out dementia screening tests has been named a winner at the world's largest healthcare awards programme, the HSJ Awards. In a record pool of 1,500 applications, ACEmobile, developed by Dr Craig Newman from the University of Plymouth and Dr Rupert Noad from University Hospitals Plymouth NHS Trust, was named the winner of the ‘Using Technology to Improve Efficiency’ category at the ceremony at the Intercontinental at London’s O2 on 21 November. ACEmobile is the first tool of its kind, supporting doctors and nurses through the whole process of a common dementia screening assessment known as the Addenbrooke's Cognitive Examination III (ACE III). The ACE III consists of 19 activities testing cognitive domains including attention and memory processing. It uses the benefits of computerisation, such as onscreen instruction, to empower more members of the clinical team to feel confident carrying out screening for dementia. A free-to-use iPad based tool, the app has been developed using human factors testing to reduce the error rate when used in routine clinical practice. It was also supported by the National Institute for Health Research Collaboration for Leadership in Applied Health Research and Care South West Peninsula (NIHR PenCLAHRC). Designed by clinicians for clinicians, the app also collects secure and anonymised data to allow the team to improve their understanding of dementia and ability to detect it earlier. ACEmobile currently has 1,200 registered clinical sites, and it is free for clinicians and clinical teams to access. Two other projects with University of Plymouth involvement also reached the finals of the HSJ awards this year. Dr Susanne Smith, Lecturer in Postgraduate Education, was part of a team shortlisted for the Creating a Supportive Staff Culture category, in a project led by the South West Academic Health Science Network with frontline teams from across the South West region entitled Improving Safety Culture – a whole system approach in South West England. Meanwhile Professor Richard Byng, Dr Julian Elston and Dr Felix Gradinger from ITSMed and NIHR PenCLAHRC worked with Torbay and South Devon Foundation Trust on its project Our community, Our Patient. Our Problem. Our Solution. Fully integrated local health, social and voluntary care in South Devon. The project was shortlisted for the Community or Primary Care Services Redesign – London and the South, and was funded by Torbay Medical Research Fund and PenCLAHRC, and supported by the University of Plymouth. Bringing together scientists, clinicians and expertise from across the spectrum of scientific discovery, medical research and health technology. Home to the University of Plymouth’s world-class biomedical, clinical and applied health research. The eHealth and Technology Research Group is focused on the impact and implementation of eHealth, on patients' use of the internet, and online collaborative learning between patients and professionals.